7. Phytochemistry and Pharmacology of Lycium barbarum L. and Schisandra chinensis (Turcz.) Baill" or "Neuroprotective phytochemicals of Lycium barbarum L. and Schisandra chinensis (Turcz.) 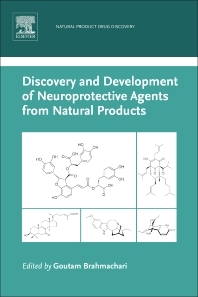 Baill"
Discovery and Development of Neuroprotective Agents from Natural Products draws together global research on medicinal agents from natural sources as starting points for the design of neuroprotective drugs. From the prediction of promising leads and identification of active agents to the extraction of complex molecules, the book explores a range of important topics to support the development of safer, more economical therapeutics for these increasingly prevalent diseases. Beginning with an overview of current developments in the field, the book goes on to explore the identification, extraction and phytochemistry of such neuroprotective agents as antioxidants, biophenols and naturally occurring anti-inflammatory steroid analogues. Specific natural sources of bioactive agents are reviewed, and the development of these agents into therapeutics for a number of specific neurological disorders, including Alzheimer’s disease, Parkinson’s disease and ischemic brain stroke, are discussed. Combining the expertise of specialists from around the world, this in the Natural Products Drug Discovery series aims to support and encourage researchers in the investigation of natural sources as starting points for the development of standardized, safe and effective neuroprotective drugs. Goutam Brahmachari is a professor of organic chemistry at Visva-Bharati, India, and teaches courses in organic chemistry, natural products chemistry, synthetic organic chemistry, and physical methods in organic chemistry. In addition to over 20 years of teaching and research experience, he is a Fellow of the Royal Society of Chemistry, a Who’s Who in the World Listee, and a recipient of Academic Brilliance Award (2015) for Excellence in Research and the Dr. Kalam Best Teaching Faculty Award (2017). Prof. Brahmachari serves as journal referee, editor-in-chief, associate editor, guest editor, and Editorial Advisory Board Member for several international journals, book publishers, and research funding agencies. He has over 190 publications in the fields of organic and medicinal chemistry, including 22 books and over 40 book chapters, published by internationally reputed publishers.